They’ve been teasing us for what feels like forever now – “we’re not ready to talk,” “Nintendo doesn’t want to talk about it yet” “there will be something soon…” then at every large opportunity, convention or trade show, silence. We’ve been waiting, thinking “maybe they’ll show us at the NeXt convention” (sorry, really felt good about that joke), but in typical Nintendo fashion, maybe even in retaliation to the slurry and flurry of rumors that have been churning out faster than even I can keep up with -but my favorite one was the Papa John’s Pizza fiasco- they’ve decided to just randomly give us a short, three-minute “preview” of the NX (see we can’t even get a real damn unveiling, just a sneak peak…come on Nintendo! ), or should I now say the Nintendo Switch now that we have the real name. The console looks sleek and beautiful. Half of it is just the screen device. Nowhere on that shell of a console is a disc drive (Don’t let that open slot fool you, that’s for controllers! 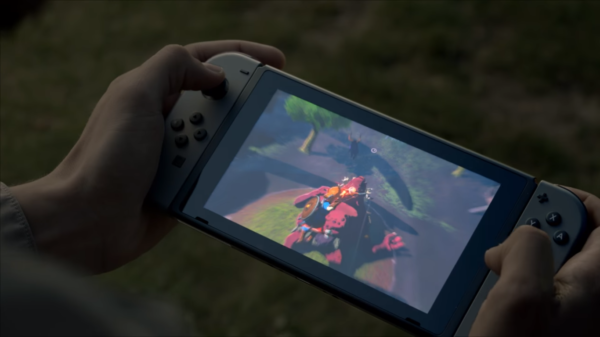 ), which means EVERY game the Switch will play is either digital or cartridge-based. These look similar to 3DS cartridges (every news outlet seemed to push the fearful idea that these would be N64 sized chunks of plastic…really? Come on now) which begs the question if this will really replace the 3DS as well as the Wii U. It’s unlikely since the Switch seems to only use one screen at a time, but Nintendo works in mysterious ways. This is a very small device so I’m wondering where all the power is stored. 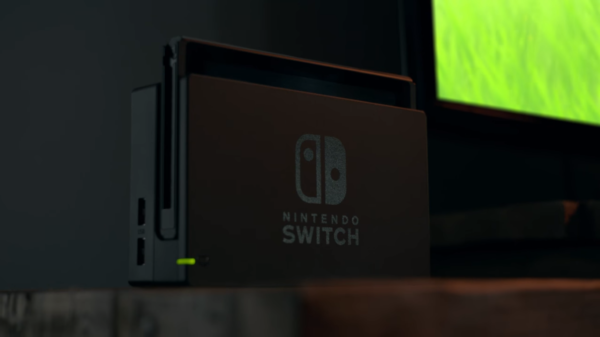 Rumors have been everywhere as to where this thing stands in terms of competing with the other two consoles, but I’m not sure how Nintendo could take all the things those other large, clunky consoles have inside and shrunk it down and put it into the case of the Switch. The sides of this controller have LED lights built in to show when a controller attachment, called the Joy-Con, is plugged in. I’m guessing it also serves as a touchpad…which makes me wonder if somehow, the Wii U Gamepad can still be used. The Elder Scrolls: Skyrim is confirmed for Nintendo Switch. That’s pretty huge. This is a nice clean shot of where the game cards will go and gives a rough size comparison. They seem to be similar to 3DS cartridges if not just a bit smaller. The Switch Screen (you can patent that Nintendo) comes with a kickstand. Beautiful idea. 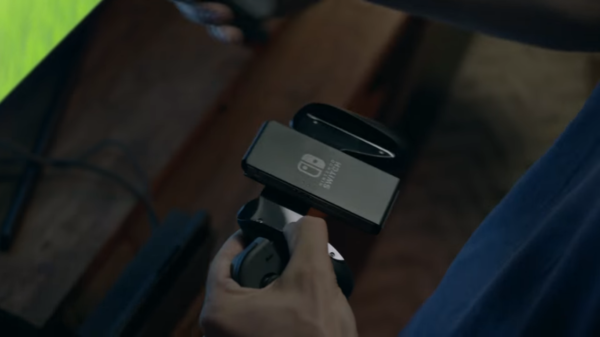 In this shot, the guy puts the screen up and takes off the Joy-Cons and has them in each hand, playing without any connections. It’s like the took the best features of the Wii and Wii U, made them ideally better, and slapped them onto this device. Thanks for that! 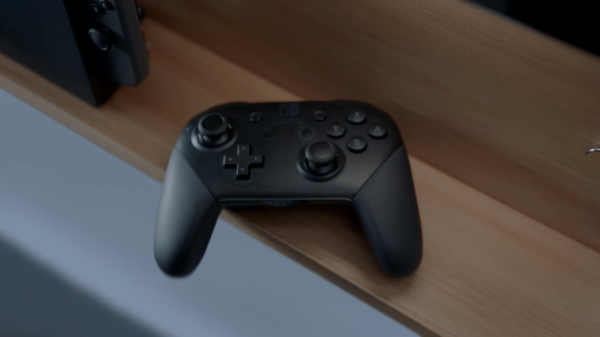 The standalone controller, the Nintendo Switch Pro Controller, looks great. I wonder how many people will be happy/upset that the layout of it matches the Gamecube again. Oh god Nintendo please tell me that this means we’ll get Gamecube games. It also resembles the Xbox controller, but the Xbox doesn’t have Gamecube games so I don’t care. Mario Kart 8 is making a return with some new updates (King Boo being one and two item slots being another), here we see how multiplayer racing games can be played while the tablet is on its own…taking each Joy-Con and putting it on its side. That’s clever, Nintendo. Splatoon is also making a return and I’m kinda glad they included actual eSports teams to show off that part. Ties into the whole tournament they had where the winner of a Splatoon tournament won a Nintendo Switch. There’s some kind of multiplayer. Since it’s a console, it’s almost like LAN but since it’s a handheld as well, it’s cool. Wonder how this works. That brings up a good point to remember that outside of this video with nothing but a song to it and the press release, there’s absolutely no information on how this is even going to function or what it can do besides the plethora of rumors that all contradict one another. I do think having sports games and the ability to take this outside AND the ability to play multiplayer and the games still seem to be high-end titles similar to what you’d get on other consoles REALLY adds hype to the console. This is a great way to bring people over to Nintendo’s side of the fence. Where else are you gonna play Madden outside your house on a picnic table in the middle of a school playground with no extra materials than on the Nintendo Switch? Mario is back and super colorful, and amiibo seem to have some sort of presence (of course they do). The level design from the shots we’ve seen seem to imply this is another Super Mario 3D xxxx title similar to Land and World, which aren’t my favorites and I’m hoping I’m wrong. 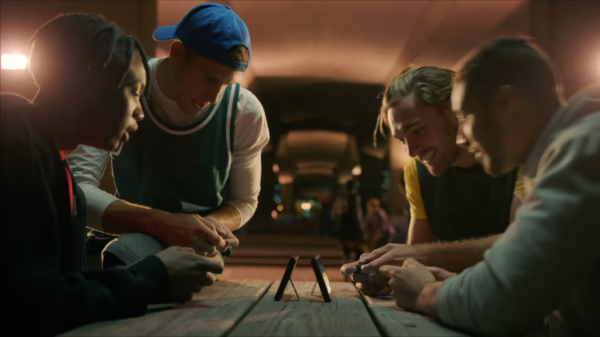 The same scene in the trailer shows the girl playing Mario leaving to go to a party and brings the Nintendo Switch and suddenly she’s handing one Joy-Con to another person and they’re playing multiplayer…but we can’t see what’s going on. Kind of affirms my idea of it being similar to 3D World. Overall, that’s the whole gist of what we’ve seen so far. 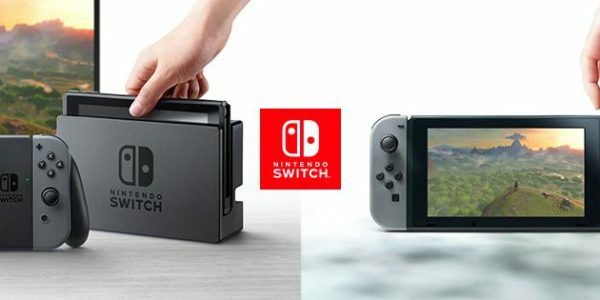 As far as price points and release dates and what’s included, will there be bundles or different setups (please don’t make a white Switch and a black Switch and relegate one to a certain model again), that’s all up in the air. Will we learn more soon? Who knows. It t0ok us this long to get three minutes of action, who knows when Nintendo will put out again. They call the screen the actual system, which is powered by Nvidia using a custom-built Tegra processor. To sum that up: someone just put a Hemi engine inside of a VW Beetle (but in this case, it actually works) The thing you keep in your house and connected to your TV is the “system dock.” There’s some sort of machinery inside it, because it has two USB ports. I wonder how much of everything is divided between the two. Local multiplayer is indeed a real thing, though that’s kind of obvious from the video. 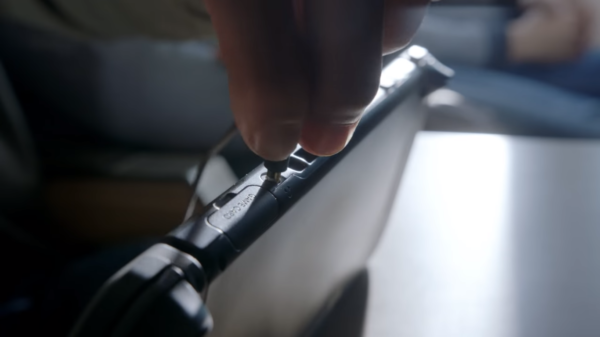 The controller dongle that the Joy-Con pieces connect to when not on the screen is called the Joy-Con Grip Accessory. 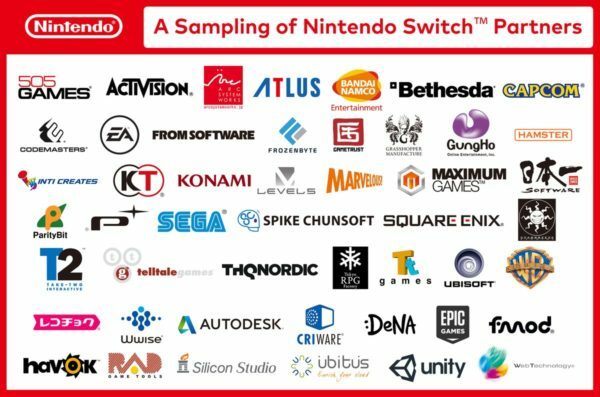 Are you remotely interested in the Nintendo Switch? Has this video flipped the switch (ugh) on how you feel about the “NX” being Nintendo’s next console? Be sure to tell us in the comments or at any of our Twitter resources and you may find yourself included in a future discussion podcast!